Since we’re all super busy these days, I’m going to keep things simple and give you a quick and easy recipe. Because if there’s one thing I know is that during holiday season the most valuable thing is our time. And clearing your schedule for an evening (with no work, no cooking, no phone calls) is the best gift you could ever give yourself. Imma right? So a recipe that requires very few ingredients, little preparation, and cooks in a flash, might be just the right thing for you. So here I present you with these very delicious Butternut Squash Fritters. The fritters look more or less like sweet potato latkes, minus the sweet potatoes. I have to be completely honest here, this was the very first time me making butternut squash fritters. Sure, I’ve made latkes, zucchini fritters, and cauliflower fritters like a gazillion times. But butternut squash fritters? Definitely a first. And since I’m in the mood for confessions let me say that I didn’t believe for one minute that these fritters were worth making. But when I took my first bite, I was proved wrong. These butternut squash fritters are legit, in all due respect. They’re crispy, slightly sweet, and full of butternut squash and sage flavor. 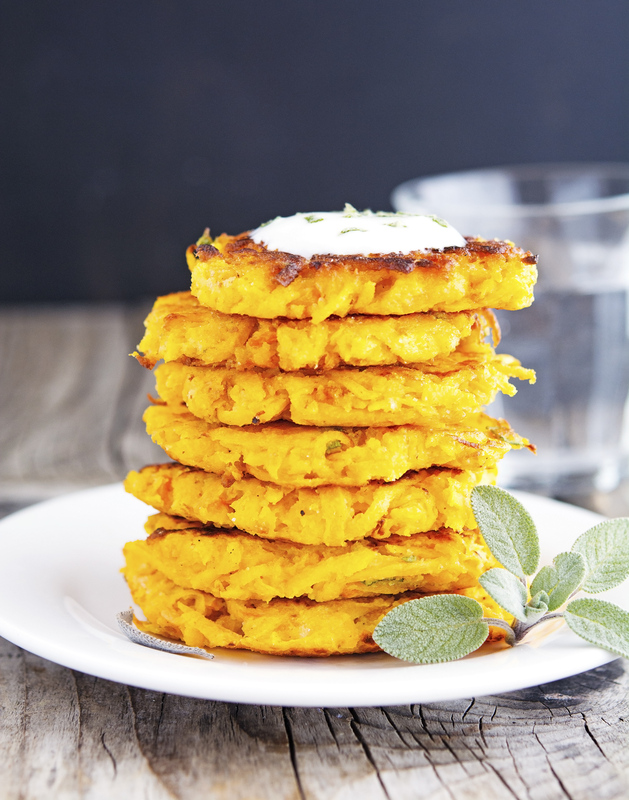 If you like butternut squash, you will love these fritters. They’re a slam dunk! 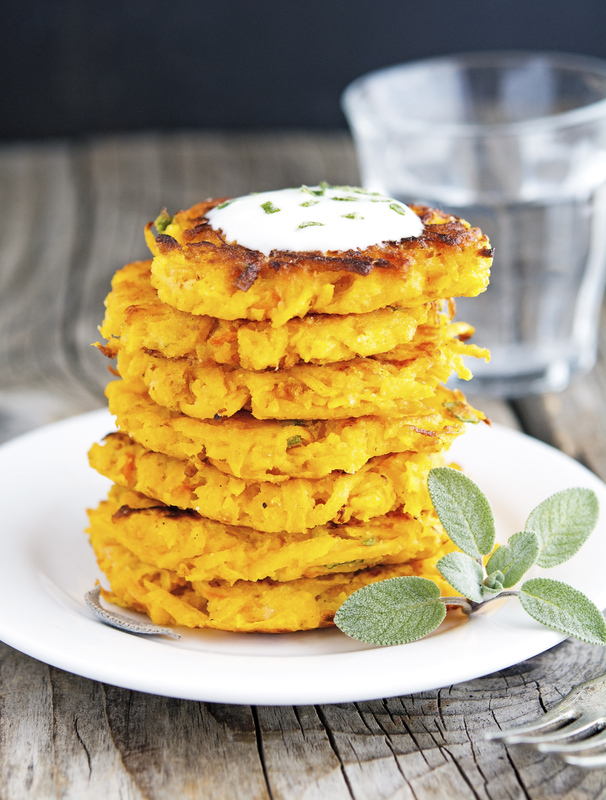 Butternut Squash Fritters (Low Carb & Gluten-Free) Print this recipe! Preheat oven to 200°F (95°C) and place a rack in the middle. In a large bowl combine shredded butternut squash, almond flour, eggs, sage, salt, and pepper. Heat two tablespoons of oil in a large heavy frying pan over medium-high heat. When sizzling scoop 2 heaping tablespoons of mixture into the pan, press them flat with the help of a spatula, and cook until golden-brown, about 3 minutes on each side. Drain briefly on paper towels to soak up any excess grease, and immediately transfer to an oven proof dish and then into the hot oven until ready to eat. Repeat to make all fritters. 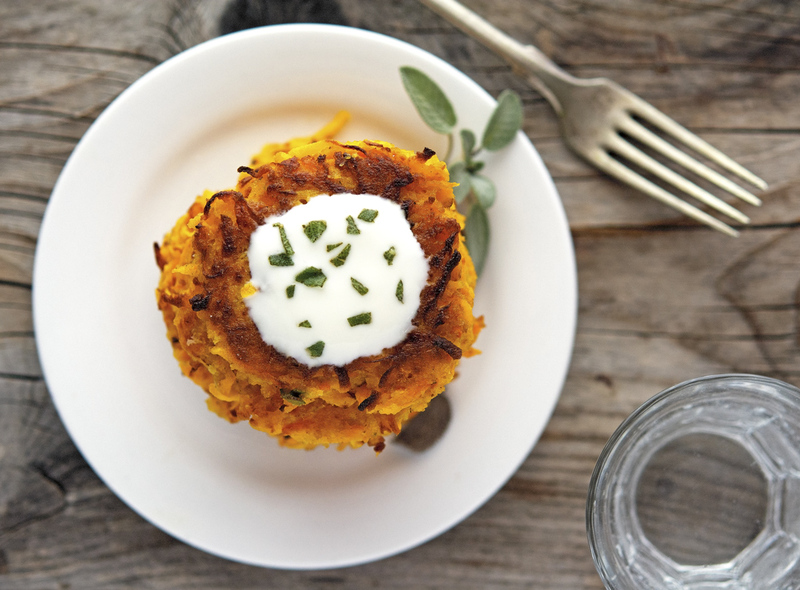 Serve topped with a dollop of Greek yogurt or sour cream and sprinkle with finely chopped sage. One fritter yields 58 calories, 4 grams of fat, 4.5 grams of carbs, and 1.8 grams of protein. I know, and just as delicious! If you put it that way, than it's a deal! I have been devouring all the things butternut squash recently, but I have not turned them into fritters yet. Obviously, that NEEDS to change! These look seriously delicious, Mike! Love that they are low carb, so I can eat my weight in these babies and not gain a pound... right?! ;) Cheers, buddy! Hope the holiday season has been treating you well! Thank you so much C. I hope you'll have a great holiday season yourself! What a great idea. I have one leftover and I'll have to make some of these tonight. Awesome, let me know how you like it! I love all things butternut squash! I'm making a prime rib roast this weekend and these look like the perfect side dish - hope your holiday is wonderful! Though I would love to spend a few minutes throwing these awesmazing (basically 4-ingredient) fritters together! Merriest of Christmases to you and yours, my friend! Squash and Almond flour, you could not go wrong. They look and sounds good. Honestly, I have been awfully calm and relaxed, everything is done. I am just hoping I didn't forget something big,...because this calm seems odd.;). Have a wonderful week and MERRY CHRISTMAS my friend!! 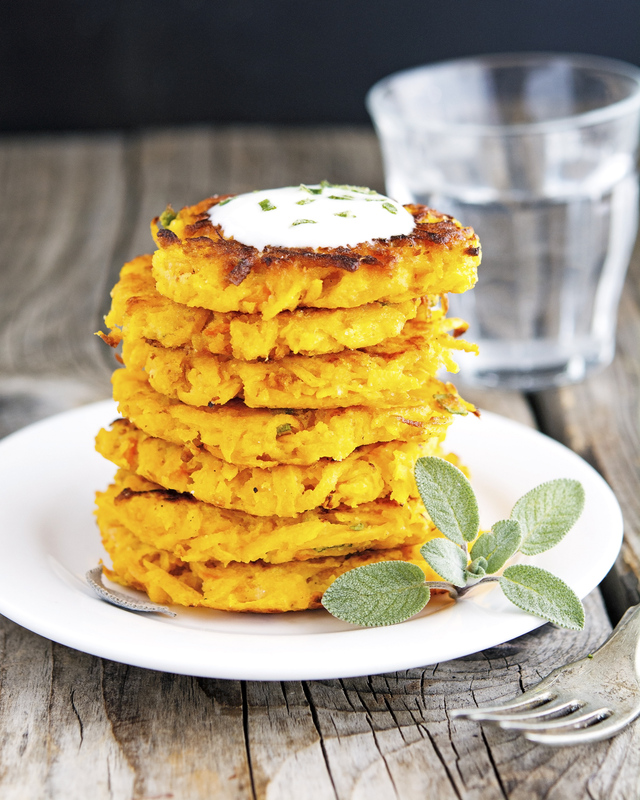 I'm addicted to sweetcorn fritters so will need to give these a go! I'll say you're a baller at making fritters!! I think the first recipe I tried of yours were cauliflower fritters. We couldn't get enough! I made these! So good! It didn't stay structured but it's still good as a hash. Easy breakfast. These were so good. What a grate idea! Wowzers! These are on the "To cook" list tonight! Do they keep well frozen, perhaps separated by parchment paper?